Pedestrianism is a word that does not immediately come to mind when thinking about Stacy Thompson, however if one looks at the interior pages of his scrapbook we find that Stacy was indeed a first class “Pedestrian,” who for his participation in two pedestrian races, won medals as well as some money and even a gold watch which now resides in the Manistee Historical Museum. Evidently, after the Civil War, a wave of interest in Pedestrianism swept the country. There were masses of people watching people walking long distances, or short distances for that matter. Baseball be damned! Pedestrianism was the sport of the century, or at least the decades between 1870 and 1880. Many matches took place in Madison Square Garden in New York City according to an article recently aired on NPR. Brass bands, refreshments and celebrities were included in the festivities as people would walk around a short lap until they could not stand any longer. Manistee, Michigan was no exception to the sporting craze. And Stacy was at the center of it. On at least two occasions he participated in a walking contest and both times he won. The first was held when Stacy was 23 years of age and the second the following year. Although the articles in the Manistee papers do not record the date, Stacy was born in 1856 and was 23 years of age at the time of the first race. That sets the date at 1879 for the first race and 1880 for the second. The Affair To Take Place Between Manistee Printers, Commencing Next Friday Evening Ever since the announcement of the big walking match at Gilmore’s garden, N.Y., which ended last Saturday, the printers of Manistee have been bantering one another for a walk and the matter has finally culminated in a match between S.C. Thompson, foreman of the Times office, Lou. Cutcheon, P.O. 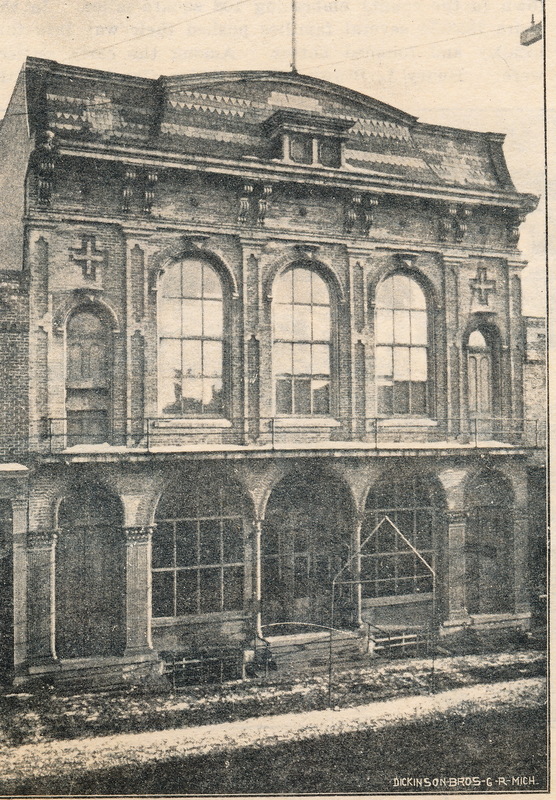 clerk, formerly of the Portland (Mich) Observer, who occasionally sticks type in the Times office, and Will S. McCray of this office, the match to take place at Temperance Hall next Friday Evening at 9 o’clock and ending Saturday evening at the same hour. The conditions of the match are, the party making the greatest distance in the time specified takes the medal and the first money, $25, second $15, third $10. The pedestrians can walk, run, trot, crawl, or choose any other method of locomotion. The contest will doubtless be very exciting as the participants are fellows of nerve and pluck. S.C.Thompson is well known to our citizens having worked here at he printing business for about nine years; he is in his twenty-fourth year, weighs 155 pounds and is 5’81/2″ in height. He has made a 3 mile swim, can lift a thousand pounds, but has yet to make his record in walking. Lou F. Cucheon is in his twenty-third year, weighs 157 pounds, and is five feet nine inches in height; his power to endure the walk is assured by the fact that he has made baseball playing almost a profession previous to coming to Manistee, and has performed the feat of running a baseball diamond in 17 seconds. Will S. McCray is in his twenty-first year, weighs 139 pounds, is 5 feet six inches in height and sports an honorary membership medal of the Athletic Society of Newburgh, N.Y., which he won in a foot race at that place. The pedestrians will be attired in walking costume, and after the walk a grand ball will be given, in which everybody is invited to participate. Some Fine Fun Expected at the Temperance Hall Friday and Saturday. Next Friday Evening one of the most exciting contests will commence at Temperance Hall ever seen in this city. It is no less than a 24 hours trial of pedestrianism between S.C. Thompson, foreman of this office, Will McCray, foreman of the Advocate office and Lew Cutcheon formerly a printer in the Portland Observer office, and now P.O. clerk in this city. The walk will commence at nine o’clock Friday evening and continue until nine o’clock Saturday evening. A saw dust track will be prepared in the hall, and ample preparations will be made for seating at least 500 people. Ladies will be especially accommodated with comfortable seats, and the very best order of decorum will be enforced so as to make it a pleasant exhibition of pluck, endurance and speed for any one to witness. The contest will be for a gold medal worth $15 and a purse of $50, the one making the greatest number of miles in the 24 hours to have the medal and $25, the second $15 and the third $10. Thompson is 23 years of age weighs 155 pounds, and is 5 feet 8 1/2 inches high. Cutcheon is 23 years of age weighs 157 pounds, and is 5 feet and nine inches high. Will McCray is 21 years of age, weighs 139 pounds and is 5 feet 6 inches high. The contestants will be allowed to walk, run, hop, skip, jump, creep, crawl, roll, tumble or scramble along – any way so they get along. They will also be allowed to rest, eat, sleep, stay awake, drink, or do anything else they please during walking hours, except to wink at the girls. After the walking match has closed Saturday night there will be a grand ball in the hall. Admission to the hall including ball 25 cents, which proceeds will be used to pay the necessary expenses of the hall, printing, etc. As we stated last week, the race between Frank Hand, of Hoffman’s office, and Stacy Thompson, of this office, for the purse of $6.00 took place last Tuesday, which resulted in a decided victory for Thompson. Early Monday morning preparations for the great contest commenced for each appeared to think that his honor was at stake as well as greenbacks. During the day they practiced with the type, felt of them, rubbed them, etc., to be sure there was no deception, cleaned the lamps – for which we are thankful, for they needed it badly – as they would have to use them in the morning. Water was provided – not to drink, but merely in case of friction – and a wet sponge was procured to cool their aching brows. One of them appeared a little “narvous,” but felt confident that victory would perch upon his banner. After a few moments devotional exercises Monday evening they left the church and sought their humble couches, but not to sleep. About 4 o’clock they arose, and after a “light” repast wended their way towards the scene of conflict. Upon their arrival they stripped and rolled up their sleeves, displaying muscle and courage seldom witnessed, very much resembling Heenan and Morrisey preparing for a mortal combat. Promptly at 7 o’clock they took their position looking meek and sad, well knowing that one of them must be sacrificed. Click, Click, went the type. In fifteen minutes it was painfully evident that Frank was completely un-Hand-ed, nervous and agitated. We pitied him from the bottom of our foot, and counseled him, but to no purpose. Thompson, in the mean time, was going like a locomotive, and in 40 minutes Frank informed his antagonist that he would through up the sponge provided he would treat to the peanuts, which Stacy, in the fullness of his heart, consented to. 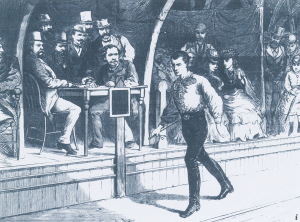 Mr. Nix held the stakes, and it will be seen by the following note that the money was fairly won, and given up: Frank Nix – Sir: Frank Hand yealds the “belt.” You may give Stacy the money. They are both fast compositors, and may yet make their fortune by sticking to the case. Well, that is the end of the entries concerning the short career of Stacy Thompson as a “Pedestrian.” In future entries, you will discover how much Stacy loved to walk and how much “walking” became a part of his political life. But that is for another not too distant entry. I will close this entry concerning Pedestrianism in Manistee with the following three photos all taken about the time the races were held. 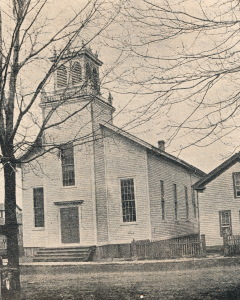 The first is the Methodist Church which was built around 1860. 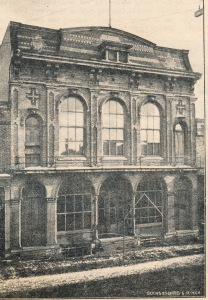 The second is the building I think to be the Temperance Hall referred to in the articles above. 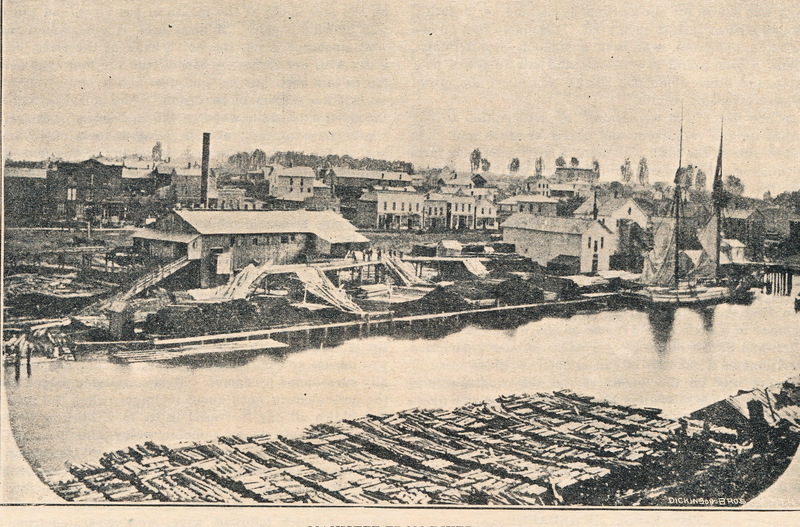 And the third is a photo taken of downtown Manistee in 1868. Notice the large “bundle” of trees floating in the Manistee River, awaiting delivery to the saw mills in the area. 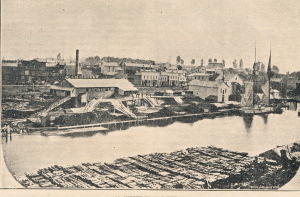 All three photos are not taken from Stacy’s Scrapbook, but taken from the fine book published by the Manistee News called The Salt City of the Inland Sees – 1899.